As Atlanta natives, Ruth Skogstad and Kristen Sodemann agree that Historic Brookhaven is their favorite neighborhood. They both have lived in the tree-lined neighborhood and boast it is a community where people are friendly and inclusive. This beautiful neighborhood is on the National Historic Register of homes as the first residential neighborhood in Georgia built around a golf course. The oldest of the 975 homes date back to the late 1800’s. There are a variety of architectural styles including charming cottages and grand new estates. Located in the middle of the neighborhood is the Capital City Club, one of Atlanta’s most exclusive clubs with amenities that include an 18-hole golf course, tennis courts, and a beautiful pool and outdoor dining room. 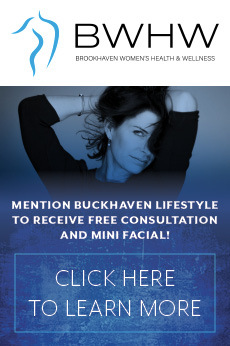 If BuckHaven Lifestyle landed in your mailbox this month, you’ll know that what sets Brookhaven apart from other neighborhoods in Atlanta are the beautiful parks, gorgeous old oak trees, and groomed sidewalks. A homeowner’s association sponsors this month’s fireworks display at the golf course, a new neighbor’s party at the Capital City Club and a family picnic in the fall. We look forward to discovering and exploring beautiful homes in the neighborhood on the biennial Historic Brookhaven Candlelight Tour of Homes or Brookhaven Dines In events benefitting the Atlanta Ronald McDonald House Charities. Ruth Skogstad is a long-time resident of Brookhaven, and her home was on the first tour in 1998. Her office, Skogstad-Sodemann Team, along with Beacham & Co, now is the presenting sponsor of the Tour of Homes, set for October 5. She has been instrumental on the tour committee since its inception, building sponsorships and marketing, and driving attendance to the tour. We asked Ruth to share a few of her favorite homes in the neighborhood. (These are not on the tour.) The homes that will be on the October tour will be announced in the magazine next month (we are the proud media sponsor). 4555 Club Drive – Classic traditional home on one of Historic Brookhaven’s favorite streets. Great family house with sport court in back. 4418 Davidson – Stunning new construction on beautiful level lot. Very quiet, private setting.